Three Roots International focuses its work in one or two communities, providing integrated solutions, rather than providing a single service across many locations, to deliver the most impact. We do this by using a “family development model”, which focuses on strengthening the entire family, through support for children, parents, and caregivers. By focusing on integrated solutions, we recognize that poverty is a complex problem and requires comprehensive solutions. For example, a family can benefit from having a child in the Three Roots sponsorship program, while that child’s parents are also benefiting from our community health and income generating training. The integration of our health, education, and income-generating programs allows families to build strong and solid foundations for future growth. The local church plays a critical role in identifying the needs and existing resources of the community, working with Three Roots to develop and implement solutions, and training volunteers to help carry initiatives forward. We are highly committed to building local leadership capacity, and 100% of our field staff are nationals. In Ethiopia, there is only 1 doctor for every 40,000 people. According to the World Health Organization, there are nearly 1.2 million people living with HIV and AIDS and about 800,000 AIDS orphans in Ethiopia. Physical wellness is essential to human development and allows people to participate in every aspect of life, from attending school to making a living. Without basic health needs met, such as access to clean water, additional development cannot take place. We believe that knowledge is power, and that education around the causes of illnesses and how to prevent them can help decrease the spread of preventable diseases. To help address the community’s health needs, Three Roots offers a health education program designed to train women on common health concerns, as well as direct medical care, and a training development program for women who desire to train others in the community. Using hands-on instruction, the program empowers this group to train other local women about vital health information to protect their families and children. 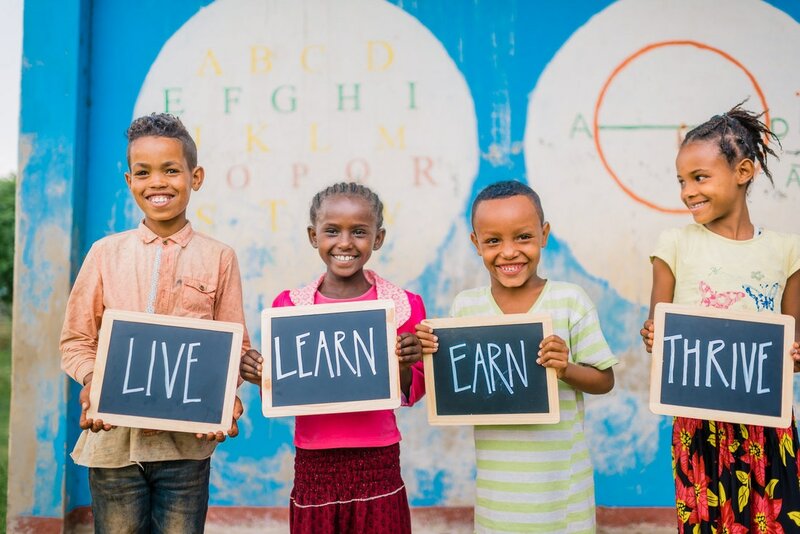 There are several factors that contribute to the under-schooling of children in Ethiopia. First, parents who have not completed secondary school may be less likely to see the value in education. Additionally, parents are focused on providing for families and may not see the need for education. Also, barriers such as the prohibitive cost of school fees, supplies, and uniforms. Education provides the foundational skills that are necessary not only for the life of the individual, but also for the family and the broader community. An education can propel a child out of the cycle of poverty and empower him or her to pursue new economic opportunities. For parents who wish to send their children to school, we want to remove the barriers. Based on the community’s expressed need and interest, Three Roots offers a child sponsorship program to cover the costs of school supplies, uniforms, medicine, and more. Please visit our Sponsorship Page if you would like to learn more. More than 85% of Ethiopia’s workforce is employed in agriculture and depends on farming for survival. This means that drought conditions can have an enormous impact not just on food supplies, but on farmers’ ability to bring in income. Financial stability is critical to sustaining a high quality of life. Without financial resources, a family cannot purchase the food or services that they need for health. A steady source of income also provides opportunities for families to save money and invest towards a larger expense, such as neonatal care for a pregnant mother or secondary education for a child. Skills development can also give families a focused specialization in the workforce, while business planning training allows families to create their own source of employment through a small business when job opportunities are scarce. Three Roots plans to offer self-help groups to bring together community members for training on how to develop and implement a business idea, manage a business, save money, and more. With the support and encouragement of one another, members can come away with an actionable plan to earn income and the satisfaction of knowing that they can support their families’ well-being. economic capacity to sustain their future well-being.